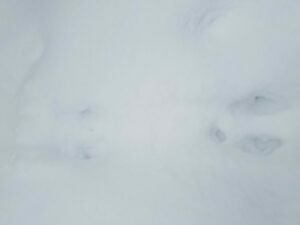 The depth of snow creates an ocean of white in Redstone quarry, only the steep cliff shows any signs of red. 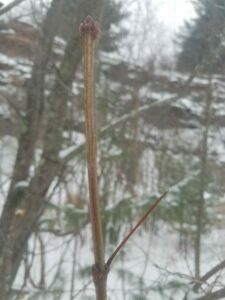 Small sparks of green spur out form the pines of a few coniferous trees. 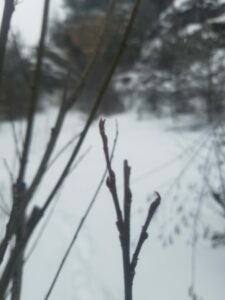 The rest is shades of brown and grey, melding over one another with yet more white clinging to barren branches. 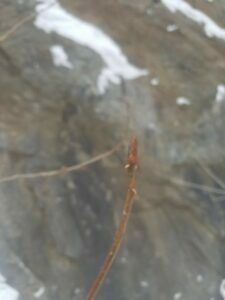 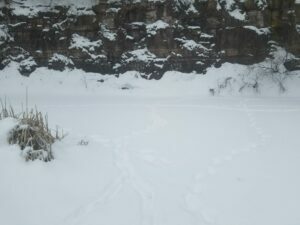 The Quarry has not changed much since my last meeting, simply more snow, more barren vegetation and more ice over the small pond of water. 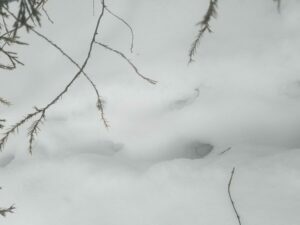 But now there is a sign of life that wasn’t there before-Tracks. 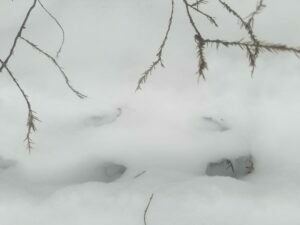 The only signs of life come from deep imprints in the snow around. 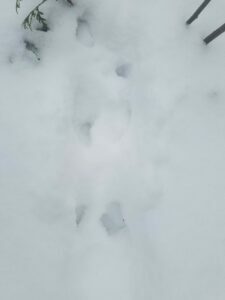 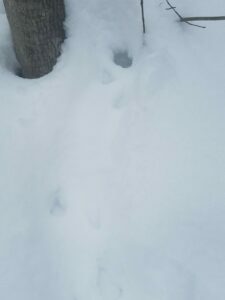 I came while snow was freshly falling and had fallen a bit the night before so now clear prints could be seen which means i relied on size, straddle length, stride length, and track pattern to create guesses of what animal tracks I was looking at. 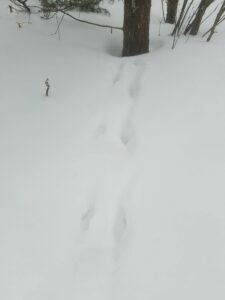 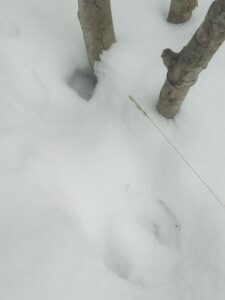 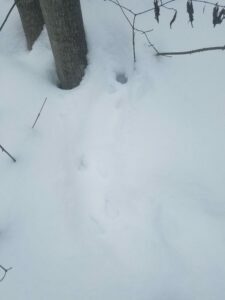 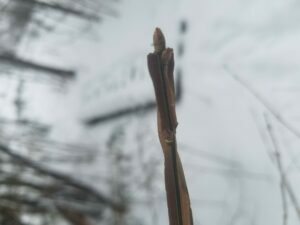 I believe some of the tracks I saw belonged to gray squirrel, potentially a weasel (short tailed) or mink, potentially a rabbit, some dog and cat tracks. 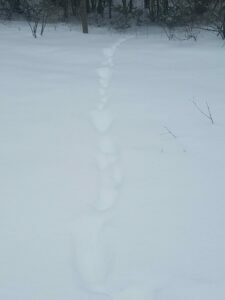 Below are some pictures of these tracks! 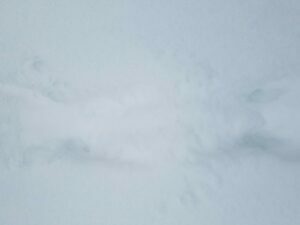 I wonder what journey’s these animals are on, food, shelter or something else. 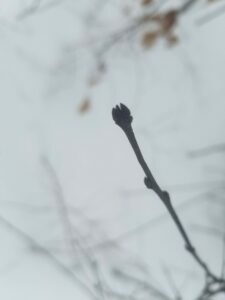 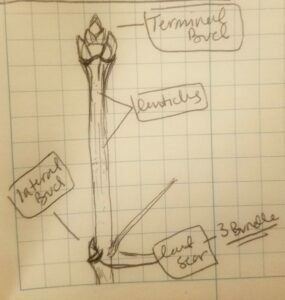 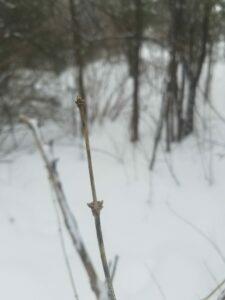 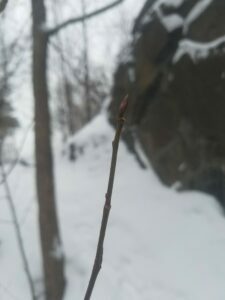 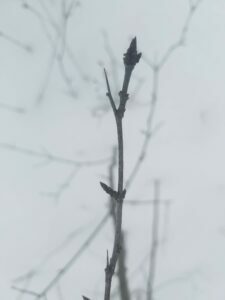 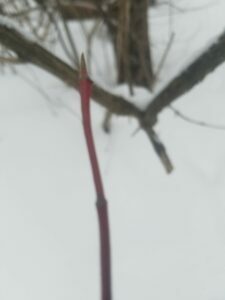 A sketch of my favorite twig(below) shows its different identifying aspects.